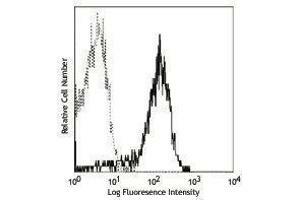 Purification The antibody was purified by affinity chromatography, and conjugated with PE under optimal conditions. The solution is free of unconjugated PE and unconjugated antibody. Background CD126 is an 80 kD IL-6 receptor α chain also known as IL-6R. It is a member of the immunoglobulin superfamily that is expressed on activated T and B cells, monocytes, hepatocytes, and plasma cells. High affinity IL-6 receptors are formed by the non-covalent association of CD126 and the IL-6 receptor β chain (CD130 or gp130). CD126 binds IL-6 with low affinity, but does not signal. The β chain (gp130, CD130) does not bind IL-6 by itself, but associates with the α-chain/IL-6 complex to initiate signal transduction. IL-6 binding to the receptor complex results in the stimulation of B and T cells, and hematopoietic precursor proliferation and differentiation. The D7715A7 (15A7) antibody blocks IL-6/IL-6 receptor interactions.